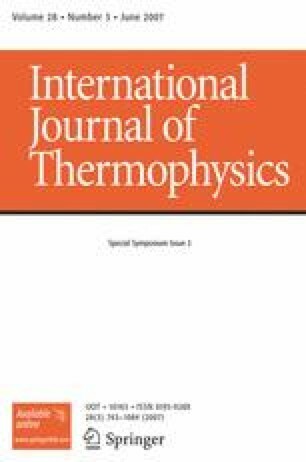 Dynamic light scattering (DLS) has been used for the measurement of several thermophysical properties of a quaternary refrigerant mixture R-125/143a/32/134a in its liquid phase under saturation conditions. The thermal diffusivity and sound speed have been obtained by light scattering from bulk fluids over a temperature range from about 293 K up to the liquid–vapor critical point. By applying the method of DLS to a liquid–vapor interface, also called surface light scattering (SLS), the saturated liquid kinematic viscosity and surface tension can be determined simultaneously. These properties have been measured from about 243 to 343 K. The results are discussed in comparison with literature data and with a simple prediction method based on the mass-weighted properties of the pure components, expressed as functions of the reduced temperature. Once again, the simple prediction method was shown to be applicable for the calculation of different transport and other thermophysical properties of multicomponent refrigerant mixtures and this with sufficiently high accuracy for technical practice. Moreover, the input data for the simple prediction scheme can be reduced without loss of accuracy by treating binary or ternary mixtures as a subset of the multicomponent mixture.